Lecithin, otherwise known as phosphatidylcholine, is a phospholipid, or fat molecule, that contains necessary nutrients for bodily functions. Such nutrients include choline, fatty acids and phosphates. The majority of nutrients found in lecithin are stored in the form of choline. The body can produce choline only in small quantities, so we must consume lecithin-rich foods to get adequate amounts, Oregon State University's Linus Pauling Institute explains. One of the best sources of lecithin is eggs. Lecithin is found in the yolk of the egg. 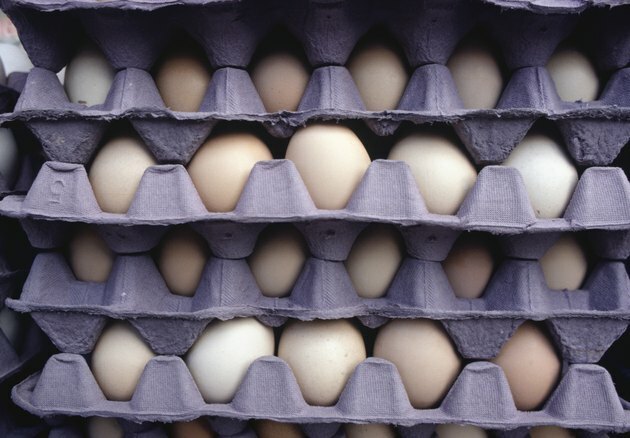 A large egg contains 126 milligrams of choline, according to the Linus Pauling Institute. The Institute of Medicine of the National Academy of Sciences recommends 550 milligrams of choline per day for men and 425 milligrams per day for women. Lecithin's main component, choline, helps digest fats, move wastes and nutrients in and out of cells and maintain permeability, according to Huntington College of Health Sciences. Your liver uses the lecithin from food to distribute this choline throughout the body via the circulatory system. In animal trials, choline was also seen to protect the liver against fatty liver disease. Lecithin, in conjunction with the nervous system, produces acetylcholine, which plays an important role in brain formation, sleep, memory and learning. Eggs are high in cholesterol, ranging from 141 milligrams in a small egg to 234 milligrams in a jumbo egg, according to the United States Department of Agriculture National Nutrient Database. The recommended daily limit for cholesterol is 300 milligrams. However, Huntington College of Health Sciences notes, lecithin in eggs actually absorbs bad cholesterol and increases good cholesterol. The mechanism by which lecithin modifies cholesterol levels may be attributed to its high polyunsaturated-fats content. Lecithin may have weight-loss benefits due to its ability to break fats down into smaller molecules. The body may use these fatty acids for energy rather than storing the fat. Lecithin may prevent gallstones, with Huntington College of Health Sciences citing research showing that low lecithin levels in patients' bile are associated with gallstone prevalence. Harvard Health Publications reports eating one egg a day is okay if you limit other high-cholesterol foods on days when you eat eggs. To cut out the cholesterol, eat only the egg whites. But remember that the yolk contains most of an egg's nutrients.